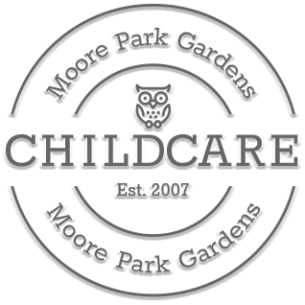 This is a reflection of the core values at Moore Park Gardens Childcare and is woven into our practises, teachings and learning environments. We believe that working in close partnerships with families is central to ensuring continuity and progression in a child’s learning, development and future success. We value children’s uniqueness and see them as capable individuals, who come to our Centre with their own interests, talents, skills, and ideas to explore. We know that each child must feel loved, valued and supported in order to achieve and thrive. We feel children have a right to be active participants in their own learning and must be empowered to express their views and ideas. This is why we empower children and assist them to make choices which encourage success and positive self-esteem. We provide individual supported learning giving each child opportunities to explore, discover, experiment and learn through interest based play. We believe that active participation from children builds individuality and fosters creative minds which enhance their natural curiosity. We believe that there are learning opportunities around every corner and that by using a holistic approach to teaching we can harness these. We foster each child’s sense of Being: living in the moment, and enjoyment for learning. Becoming: their true potential and discovery of self. Belonging: to be proud of their background, family, and culture. We know that families are the most important unit in a child’s life and the significance of their relationships cannot be underestimated. Therefore, we strive for co-operative partnerships with families so that we can create a trusting relationship which benefits and educates us all. We believe that all family structures, cultures, religions, beliefs and values must be respected and reflected in our program, and that through embracing and exposing children and families to differences we create a more tolerant and multi-dimensional society. We use the Early Years Learning Framework to plan meaningful, planned and spontaneous experiences designed to support children’s development in all domains. Through the EYLF, the program will see Educators use intentional teaching (it’s deliberate, purposeful and thoughtful). Educators are encouraged to grab hold of spontaneous moments of learning, curiosity and wonderment, immersing themselves in the child’s world to extend, question and challenge children’s ideas. We believe in best practice, trialing new teaching strategies and incorporating current research and theories into our daily practices. Above all we believe in continuing our own personal education and training by learning from families, listening to children, experiencing new activities and teaching from the heart. We are committed to environmental best practice which is integrated throughout our program, daily activities, experiences and learning. We believe that in childhood education, the children are our curriculum, in which they are active participants and collaborators who guide us. This allows for a more individualistic and meaningful involvement by the children. We know that young children must form bonds with familiar and loving carers, therefore staff consistency and continuity is vital. We believe that the best educational experiences come from face to face and hands on interactions with parents, staff and the community and we will do everything in our power to maximize these opportunities.